Planar Monolithic Industries (PMI) recently introduced two new products in their extensive line of RF and microwave components. 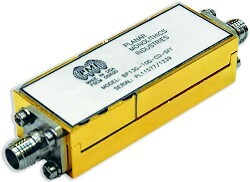 One is a 10-bit programmable, 30 dB PIN diode attenuator covering 26.5 to 40 GHz. The other is a suspended substrate bandpass filter that offers a wide passband of 8 to 18 GHz. Contact PMI today for more information. 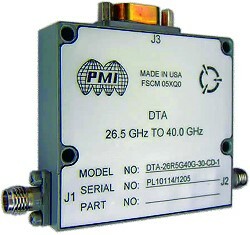 PMI Model DTA-26R5G40G-30-CD-1 is a 10-Bit programmable 30 dB PIN diode attenuator with a step resolution of 0.03 dB over the frequency range of 26.5 to 40 GHz. This model operates on a single +15 VDC supply and draws only 50 mA of current. Very high levels of attenuation accuracy of 0.03 dB is achieved. This attenuator provides ultra-fast switching speeds of 300 ns and has an operating input power rating of +10 dBm. This model is supplied in a small, light-weight housing measuring 2.0 x 1.8 x 0.5 inches. PMI Model No. BP13G-10G-CD-SFF is a suspended substrate bandpass filter that offers a wide passband of 8 to 18 GHz. This filter offers a low insertion loss of 1.5 dB typically and a passband VSWR of 2.0:1 maximum. Stopband rejection of 70 dB typical is provide from DC to 6 GHz and from 20 to 23 GHz. This model is offered with field removable SMA connectors so it can be used in connectorized form or as a drop-in module. The size is 1.94" x 0.76" x 0.5".